1.) Libraries - Each year, libraries sell off discarded books and magazines that are excellent for cutting up. Alternatively, you can spend an afternoon looking through books in the library for intriguing imagery to photocopy in colour or black and white. 2.) Thrift Shops - Look for antique and old nature books at thrift shops. I have an entire library of old picture books just for cutting up. 3.) Buying Magazines - I buy magazines just to cut up - especially European magazines filled with unusual imagery. 4.) Buying Bargain Books - I buy gorgeous image books to cut up. I search the bargain book section for good imagery when I am in book stores for discounted picture books. 5.) Dollar Stores - I search dollar stores for cheap printed tissue papers, wrapping papers, scrapbook papers and even patterned kleenex. 6.) Craigslist and Online Free Sites - Look online for people who are wanting to get rid of old magazines and books for free. 8.) Art Supply Stores - Origami paper, as well as beautiful handmade papers are available in art supply stores. 9.) Online Imagery - Specific imagery can be searched and printed off of Google Images Pinterest and Tumblr etc. 10.) Wallpaper and Paint Stores - Ask your local paint and decorating store if you can have their old wallpaper sample books. Colored paint chips work well in collage as well. 11.) Expired Calendars - These are great for backgrounds and larger collages. 12. Found Items - Old peeled paint, unique hang tags from clothing or housewares, travel brochures, old playing cards, game pieces, bits of ribbons, pieces of netting used to bag produce create an eclectic collage toolkit. - Art and Craft Magazines have expressive imagery that add depth, color, and interest to collages. - National Geographic Magazines have imagery that tap into the unfamiliar that is good for exploring the unconscious mind. - Fashion, Home Design and Martha Stewart magazines have imagery that illustrates the ideal social self. - Psychology, Yoga, Oprah, and Self-Help Magazines tap into encouragement, inspiring quotes and helpful wisdom. - Dover Illustration Books - An endless source of reasonably priced, copyright free illustrations that can be photocopied for collage. Illustrations can be ordered online in book or CD format for computer printing. - Second-hand Animal, Flower, and Nature Books - illustrate symbolic aspects of our inner nature. - Vintage Books - Available in second hand stores and thrift shops for reasonable prices, old books can be torn and cut up for collage. - Colored and Printed Tissue Paper - provides layering and transparent veiling over other collage items. - Old Drawings and Paintings - illustrates past feelings and selves. - Color Photocopies - any image from any book can be color or black and white photocopies for evocative collages. - Old Greeting Cards and postcards - for beautiful imagery and encouraging quotes. 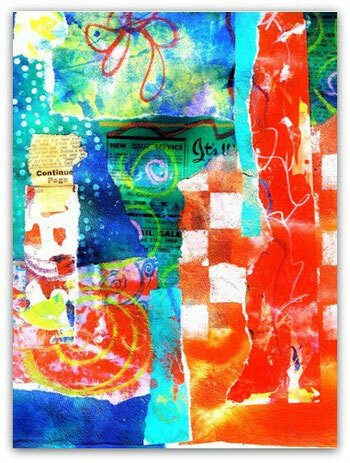 - Printed Napkins and Kleenex - adds texture, print, and color to collages. - Fabric - adds warmth and texture. - Wrapping Paper - check specialty paper boutiques for reasonably priced unusual prints and subject matter. - Scrapbook Papers - some scrapbook papers are visually rich, and offer vintage and antique looks that add patina to collages. - Old Fine Art and Art Instruction Books - can be photocopied, or cut up for gestural drawings and artistic imagery. An American academic is creating a searchable database of 12 million historic copyright-free images. Kalev Leetaru has already uploaded 2.6 million pictures to Flickr. Use the link to see many hard to find historic images - all for free online here.